Ever wish there was a place online to learn about those unwritten, word of mouth tips/hints in dentistry? There is now. CC: 53 YO Male with a chief complaint of "I need my root canal finished, pointing to tooth #28. HPI: Pt had a pulpectomy #28 approx 6 months previous. He has been asymp since. 2 months ago, I completed endodontic therapy on tooth #28. It had been initiated approximately 6 months prior and the finish was uneventful. During a scan of the patient's radiographs, I noticed that #4 had a periapical radiolucency. 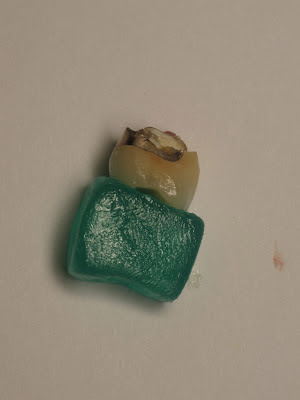 After pulp testing, I determined that the tooth was necrotic - we then planned to initiate endo treatment through the crown. My upper right tooth has been aching since this morning. I need to drink cold water to keep the pain down. It was ok during the weekend, but this morning, (day 6), I woke up and it started hurting. My pain is approximately 6/10. "Can you point with one finger where the pain is coming from", I asked. He points to roughly between #3 and 4. So, there I sat, thinking about looking for a horse and not a unicorn. I had just completed the pulpectomy on #4 and he was is asymptomatic following treatment, until a few days later. Had I opened pandora's box? What about that postural thing? He felt fine sleeping until he woke up. Sinus irritation issues secondary to instrumentation of #4? So, just to make sure that there wasn't something out of the ordinary with the pulpectomy of #4, I decided to re instrument #4, remove the CaOH, and see what was up. And as I expected. Nothing. No heme, no pus, nadda. This was completed without anesthesia (the patient was totally comfortable), and the patient noted that his symptoms had been relieved (somewhat) following treatment. I left the canal patent (no CaOH) "just in case", there may have been a need for expansion of fluid. I mean, we're going against all the things that I had been taught in my residency - almost everything except for leaving the tooth open. That, I did not! The patient was dismissed and I was planning on calling him in the morning. To be continued. Keep in mind the cold water thing. A 50 year old male presented a few weeks ago with a fistula draining from between teeth #'s 8 and 9 (11/21). CC: I have this pimple on my gums and it comes and goes - over the past few weeks. Now, the problem was trying to figure out the reason for the lateral radiolucency on #8. Why was it coming from this tooth in the first place? The patient had been asymptomatic for 30 years and why all of a sudden was this tooth causing a problem now? Was it the poor obturation or the position of the post? I talked with several colleagues and we determined that a possible reason for this presentation is a root fracture. 1. Previous history of trauma. There is always a possibility of root fracture fol trauma. It's interesting that #7 has significant calicification and #8 has a very wide pulp chamber/canal. 2. Location of post. The most apical extent of the post is at the lateral RL (radiolucency). Careful though - when you look at the fracture pictures, it appears it may be coincidence that the post is at the same level as the RL as the fracture is vertical. 3.Location of the RL. Although there is an undefined apical extent of a RL lesion on the 3 teeth in question, the lateral position of the RL on #8 gives us some clues about the nature of the problem. Look at the lateral bone destruction as outlined in red on #8. This was on the palatal portion of #8. I discussed treatment options with the patient and he elected to continue treatment with an FDP from #11-22 (7-10). For implant treatment, he will require significant osseous augmentation (block graft) and significant soft tissue augmentation. Extraction of #8 was uneventful. 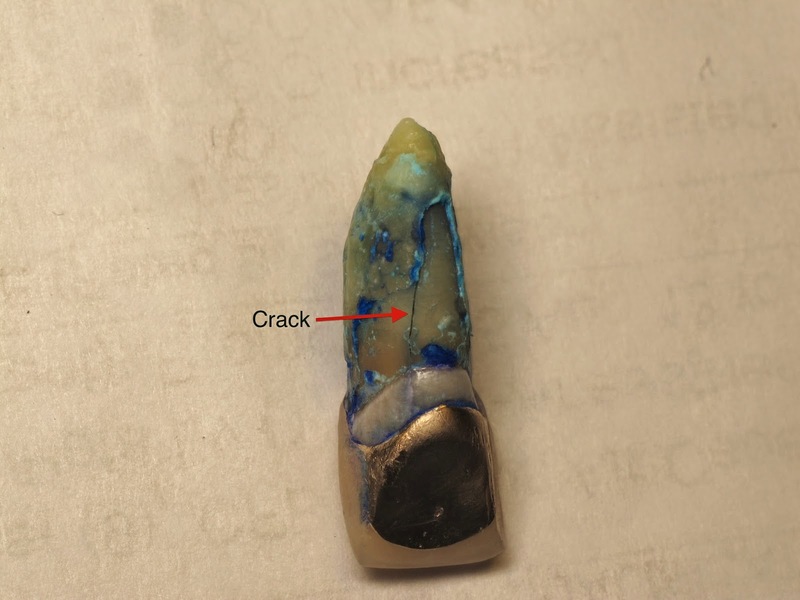 I stained it with methylene blue dye to aid in visualizing the crack. I always find it interesting when I can't probe anything >3mm and you find out it after extraction the tooth is cracked/fractured. So, keep this diagnosis in your back pocket when you see those atypical lateral RL's. When associated with an endodontically treated tooth, it may require something other than a retreatment. There are a number of ways to remove crowns - not that you typically want to remove definitely luted crowns - but - there are the times when it "just has to be done". Chief Complaint: 55 YO female presents with a chief complaint, "my crown is loose - can you cement it back on?" If it fell off, what's the success going to be if I just cement it back on? How many times has it fallen off? Did it fall off - or - did the tooth/core fracture? History of Present Illness: The patient's crown on tooth #13 (FDI #25) was dislodged over the weekend and caused some discomfort. The tooth has been previously endodontically treated and the full coverage restoration was placed approximately 5 years ago. Clinical Exam: Tooth #13 crown was still intact intraorally and on the preparation. 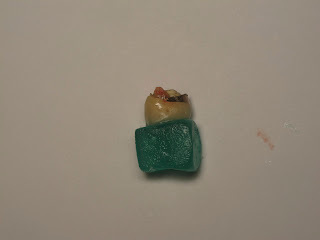 By using an explorer and engaging the palatal crown margin and lifting coronally, I was able to start moving the crown. So - the story continues - as I am about to remove the crown, I"m thinking that perhaps I had better capture a triple tray impression of the quadrant to ensure that if the crown/tooth fractures, I will at least have a "go-by" stent to fabricate a provisional restoration. The other option is of course, to take/make alginate impressions - however - this is a sick parade/emergency patient and there really isn't time. I suppose that as I reflect - I could have taken alginate impressions and rebooked her for another appointment. Either way - here we are. Anyways, long story short - the crown wouldn't come off and I suspected that she had fractured her core. After provision of some local anesthetic (you'll see why if you look at the photo), I just couldn't get the crown off w/ hemostats (my crown removal forceps were at our other clinic). So, we scrounged around and found these friends - the Richwill Crown removers. These are great little friends that only work in specific situations - and this was one of them. Dental versions of jujubes, these guys, once heated and placed on the crown you intend on removing - make life just a little easier. However, just like the instructions say - ensure that the opposing dentition is intact, or you may be removing a restoration from the opposing arch as well. 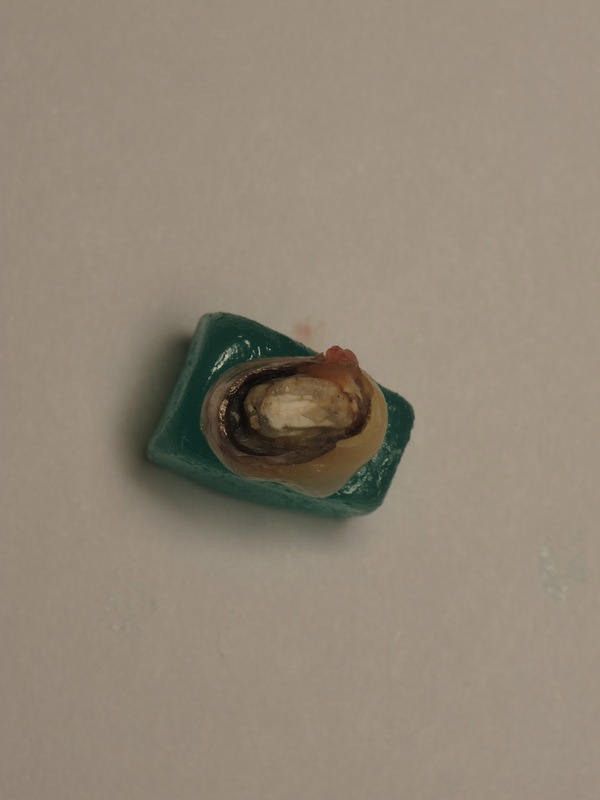 The little tag of tissue was most likely the culprit causing the patient some discomfort when the crown was rocked to the buccal. This discomfort was also a great hint that most likely the tooth/core was fractured. Here are the instructions for these green friends. The crown removed from it's resting place of 5 years. The white core material appears to be a composite core buildup. I tried to remove the crown w/out local anesthesia. Ok, the crown is off. I've moved into another clinic (with 12 other clinicians) and I'm really appreciative of the great things that I learned during my residency. Such simple things that even now I take for granted - are either not shared with others - or - we have information/marketing overload. "EVERY product is amazing" nowadays. Our endodontic cabinet is an absolute zoo. There are remnants of file systems and products from many other clinicians and I hope not to be one of those folks - but - I probably will. So here I am, standing infront of this huge filled cabinet and I'm trying to determine what's required and low and behold, there are no #6 files. Of course, there probably are folks reading this right now and think, "I don't even use #6 files". Well, uhm....ok.
For the rest of us, there are #6 files and C+ files. 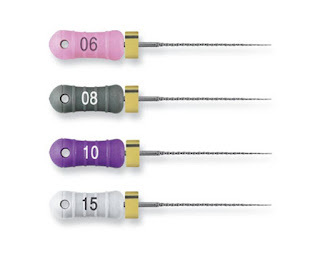 C+ files are just a little more stiff than the conventional #6 files and allow you to apply just "a little" more apical pressure. Careful - these ones have a cutting tip and who knows where that tip may cut into if you're not diligent. C+ files in their little carrying case. Ever used a mirror with an endo ruler milled into the handle? C+ files are made in the #6,8,10 and 15 file sizes. There are, however, a few other files out there that appear to accomplish the same thing. The first time I heard about them was today, when I searched PubMed for any literature on c+ files. J Endod. 2012 Oct;38(10):1417-21. doi: 10.1016/j.joen.2012.05.005. Epub 2012 Jun 29. 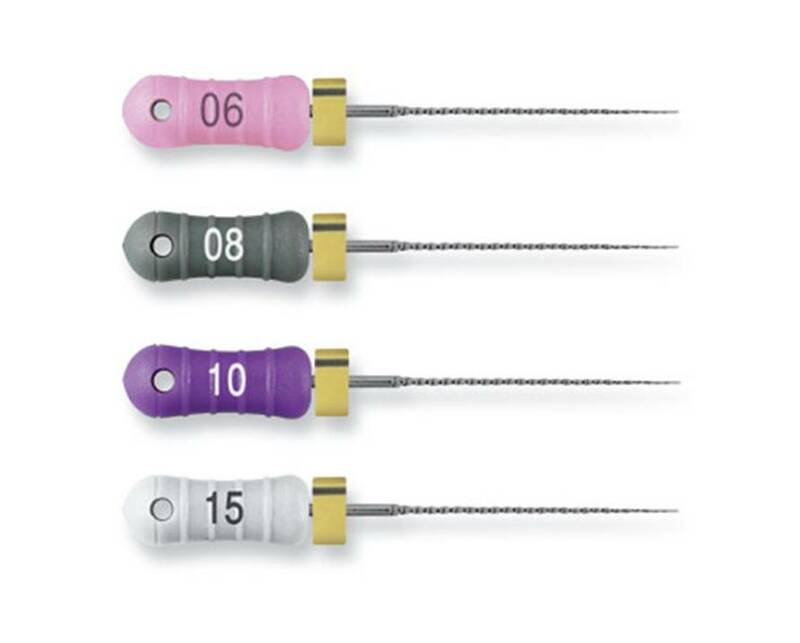 Mechanical behavior of pathfinding endodontic instruments. Try these and others out - they make just make that afternoon a little easier. Ashley Mark DMD 2012. Awesome Inc. theme. Powered by Blogger.